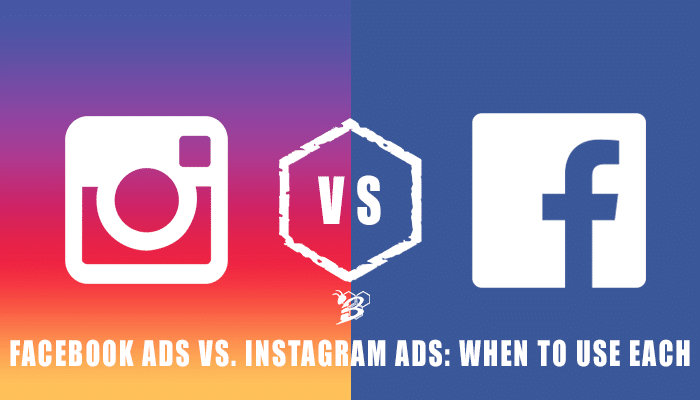 Differences between Facebook and Instagram Ads. If you’re serious about your business, you’ve probably considered paid ads marketing. But maybe you’re not certain of whether it pays off. The short answer is yes, paid ads consistently generate more traffic and leads when you use them right, even for small businesses. Pretty much everybody knows that Facebook and Instagram are owned by the same company. But that doesn’t mean the platforms work exactly the same. They maintain their own separate functionalities, despite integrating with each other in many ways. Facebook ads have a different appearance than those on Instagram. Facebook has text above the image or video. And Instagram places the text below the visual. The difference in textual emphasis has everything to do with the audience demographics for the platforms. Instagram users tend to focus on the visual, whereas Facebook users are more likely to read more text. How to use Facebook and Instagram Ads. You don’t have to choose between Instagram ad marketing and Facebook ad marketing. They can be used separately or in combination as part of your overall marketing campaign. What each ad will definitely need is an eye-catching visual, a clearly stated headline or caption, and a call-to-action (CTA) button. To get the most out of your ads, you’ll need to make sure you target them to the right audience. And that means finding out both where your audience is likely to be on social media and which specific demographics to target. You can even create separate ads for multiple demographics if your product or service appeals to more than one type of person. Having specific ads for specific demographics can help your business form a connection with more individuals. Ads are proven to generate and convert leads faster than organic traffic. That doesn’t mean you should ignore SEO and content marketing, but those methods do take longer on their own. Jumpstart your lead conversions with our Kodo Media FREE Ad trial.